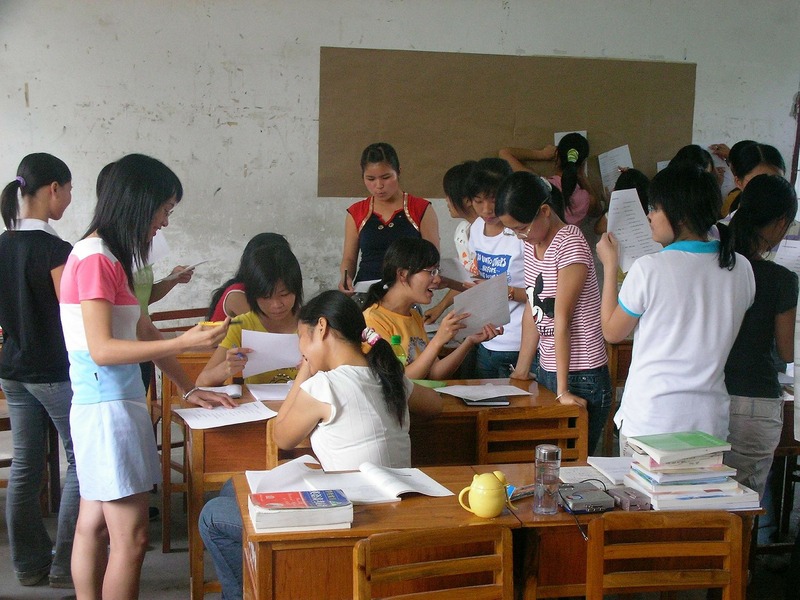 Recently I read a nice blog written by "TEFL" teacher Ashley Sheets. Ashley, or Miss Sheets, shows that teaching a (foreign) language abroad also is about learning the other way around. Learning about working and living in other cultures, acquiring new competencies, getting insights in other ways of living, etc. Miss Ashley, Miss Sheets, Ashley teacher.....I get called a lot of things. I’ve taught English as a second or foreign language in quite a few different countries over the past seven years, and my work in international schools has given me access to students from more countries than I can remember. And these students have all had different names for me. In South Korea it was Ashley teacher (usually pronounced “Ash-uh-lee teach-uh!” by the little ones in my kindergarten class). In the sweltering Marshall Islands it was Miss Ashley. My Somali students referred to me simply, respectfully, as “Miss”. Being in a room full of rambunctious 5 year old Koreans, all speaking their mother tongue and running amuck with the level of energy that is generally afforded to those of their age, was never something I expected in life. Nor did I ever expect to spend a year of my life teaching largely uninspired but utterly delightful island kids on a tiny piece of land the size of a football field (the same kids who couldn’t stand grammar lessons, but serenaded me with ukulele singalongs and shared their ramen/kool-aid mixtures with me). It just goes to show that if anything can be said about teaching English abroad, it’s that it is never, ever, dull! For everything that I have ever helped a students to learn, they have taught me something in return. Regardless of age - child, teenager, adult - they all have something to teach me, and I could not possibly have chosen a profession that had more life lessons in store for me. Sometimes these lessons have been wonderful, sometimes difficult, sometimes life-affirming. When I lived in other countries and taught in their schools, I was a complete and total outsider, doing my best to swim against the current and offer up my students all the English that they could absorb during the short time they had with me. But outside of those classrooms, I was utterly immersed in learning as much as I could about the language and culture that enveloped me almost completely. I was a tiny foreign fish in a very large pond, and I always felt that way. But teaching in English speaking countries, specifically in America and in the UK, has been a different experience altogether. Helping my little fish in the big pond that I call home, where I can speak and understand the language inside and outside of school, creates a completely different atmosphere for learning, and adds a sense of urgency for these students that just want to communicate with the world they find themselves living in. One of my very first teaching experiences is still, to my mind, one of the most rewarding I’ve had. In my hometown in Ohio, there exists a huge population of Somali refugees that have permanently emigrated to the USA. Years ago, I served as a teaching assistant in a class of only Somali woman, friends and neighbors all and ranging in age from 16 - 80, with very little English knowledge among them. These women needed the language, not just to move toward some goal of “assimilation”, or for a big test; but to find jobs and help their children in school, to fight with their aggressive landlords, and run their small businesses. It was the purest form of language learning, and many of the women didn’t even know how to hold a pencil. My oldest student was nearly 80-although she couldn’t confirm it, as she had no way to be entirely sure of the date and year of her birth. With a wide, toothless grin she came to class every evening and, along with her classmates, helped me realize that I couldn’t really see myself doing anything else but helping people just like her learn my language, if that’s what they wanted or needed to do. Now I teach in a school with a huge mix of students from countries around the world. Every day, we come together, and we teach each other. I refuse to think that they are the only ones learning anything, and hopefully they are learning as much from me as I do from them. So Ashley teacher it is. Or Miss Ashley. Miss Sheets works too. But what the students call me isn’t as important as what we continue to learn from each other. We’ve got a nice thing going. In what way -and about what- did you learn yourself while teaching abroad? Share your experiences by posting a comment, or write a blog yourself. Thinking about Teaching English Abroad? Read more about the online and weekend TEFL course and increase your chances of finding a job abroad with an internationally recognised TEFL certificate.